New post by Italian shirtmaker Mary Frittolini. Can anyone tell me what brand of thread or floss she's using? The label appears to say "48". Thank you for your answers. It definitely looked like floss. I assume that she's using it for something like top stitching, buttonholes, or a monogram. She wouldn't be using it, even single strand, for sewing the main parts together, right? the floss looks like anchor 6 strand, i believe the 48 is the color code. the floss is usally used for cross stitch and embroidery, very easy to find. beautiful work she does! oh, just saw the other posts, after i posted...apologies. 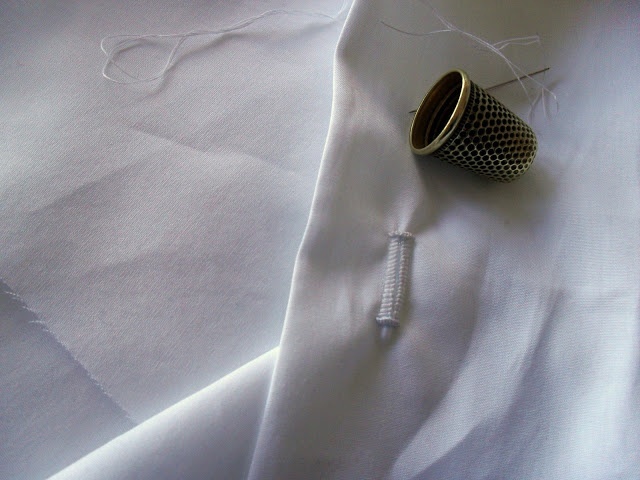 would think that the anchor thread would be used stranded for monograms, possibly for buttonholes, but doubt for seams...any of you professional shirtmakers know? Maybe something to get your teeth into? Edited by necchi, 01 July 2015 - 09:57 AM. I've heard of some sort of yarn being used on really lightweight coat cloth instead of gimp, because the gimp is to heavy, large, stiff. So something softer, lighter, thinner is better. Haven't heard that for shirts, though. It makes sense that the floss would be used for monograms or buttonholes. I was confused because the post title mentioned the shoulders. I downloaded the photos and blew them up, I think she is using the floss to sew the seams. Greger - interesting idea about the gimp. Its so hard to locate and color can be an issue. Edited by SPOOKIETOO, 02 July 2015 - 12:35 PM. Maybe your house is to new. I agree with this. I think she's using the embroidery floss to sew the shoulder seams. My guess is that the reason that she's using embroidery thread is because the colour palette available is so extensive, allowing for a closer match to the colour of the cloth. Wouldn't the floss be more supple? And a bit thicker than Mara type thread so it could be strong enough. May be, but pale pink isn't that hard a color to match in thread.